The Green Hill started out as a homework project at school in my graphic design class in 2008. My classmates & friends enjoyed my designs so I screen printed on shirts. All designs, photography & web are by Kellen unless stated. This homework project is an assignment that will never end! Enjoy your Green Hill Clothes from Seattle while you live The Art of Fresh! 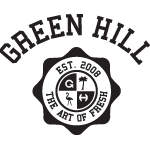 All Green Hill products can only be purchased online at this website of greenhillclothes.com. If you see a Green Hill design that is sold on any another website, please report it to us. Don't be fooled by fakes! For FAQ (frequently asked questions) & info on Orders & International orders click here.